Saturday February 18th 1899 Will went to town today. I was busy with the work all forenoon. I went to Gregorys in the afternoon to see how Mrs Bell was and Will stopped for me. I did mending in the evening. 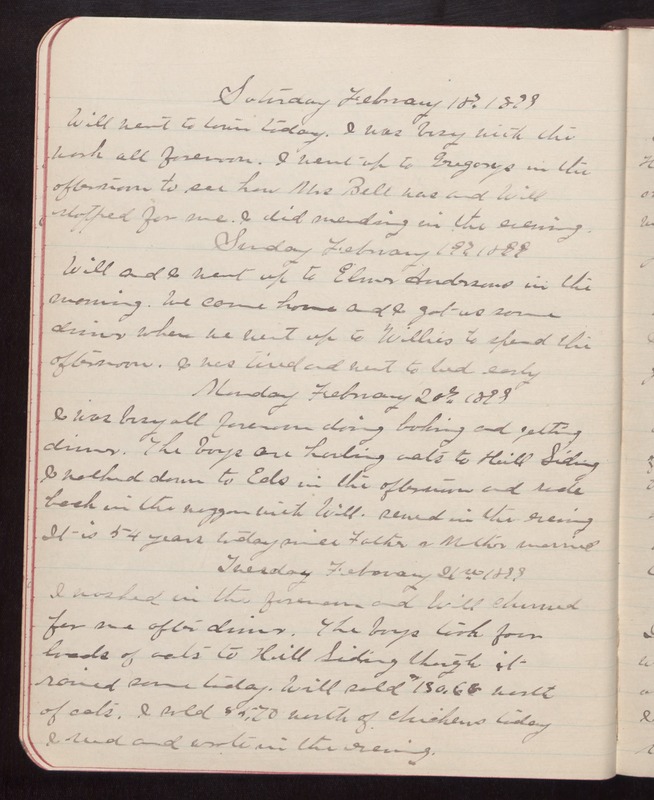 Sunday February 19th 1899 Will and I went up to Elmer Andersons in the morning. We came home and I got us some dinner when we went up to Willies to spend the afternoon. I was tired and went to bed early Monday February 20th 1899 I was busy all forenoon doing baking and getting dinner. The boys are hauling oats to Hill Siding I walked down to Eds in the afternoon and rode back in the waggon with Will. Sewed in the evening It is 54 years today since Father & Mother married Tuesday February 21st 1899 I washed in the forenoon and Will churned for me after dinner. The boys took four loads of oats to Hill Siding though it rained some today. Will sold $130.68 worth of oats. I sold $5.70 worth of chickens today I read and wrote in the evening.